Few regions have undergone more profound change in the past half century than San Jose and Silicon Valley. Since the 1950s, the area from Palo Alto to San Jose has transformed from an agricultural economy into the world's leading center of technology innovation and entrepreneurship. Waves of innovation—in defense electronics, integrated circuits, personal computing, the Internet and networking—powered business start-up and growth, and fueled immigration from across the United States and around the world. Small, disconnected communities grew together into a well-known region of more than 2.3 million people. The region's urban center, San Jose, grew from 95,000 people in 1950 to nearly 950,000 in 2005, and to more than a million in 2010. Today it is the 10th largest city in the United States. Despite the employment contraction following the 2001 dot-com bust and again following the 2008 mortgage meltdown, the region still remains the most significant concentration of technology companies and talent in the world. To remain a major center for technological innovation and entrepreneurship, Silicon Valley has needed to constantly reinvent itself. 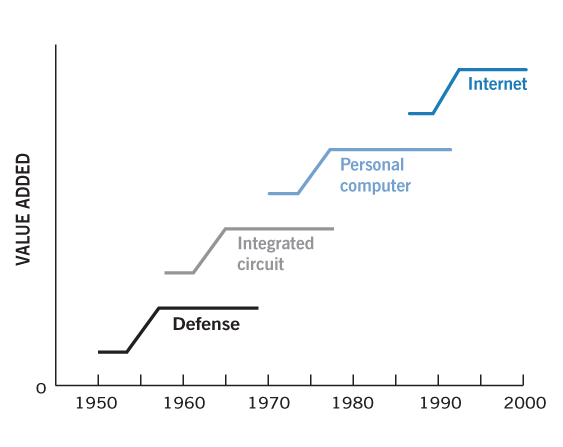 Over the past 60 years, wave after wave of innovation has transformed both Silicon Valley and the broader economy: the commercialization of the integrated circuit, the development of the personal computer, the application of the Internet, and Web 2.0. Each of these innovations changed the nature of the economy in fundamental ways—as the railroad, electricity, and the radio did in the past. Silicon Valley's economic history can be traced through distinct economic eras or waves of innovation. World War II, and especially the Korean War, had a dramatic impact on the Valley by increasing demand for electronics products from Valley firms such as Hewlett-Packard and Varian Associates. Defense spending helped to build the technology infrastructure of firms and support institutions during the 1950s. During the Cold War and the space race, what mattered was not just the level of spending, but how the Defense Department procured technology. Often, the defense agencies specified their requirements and let the firms innovate to find solutions. In addition, the Defense Department required second-source arrangements, in which producers ensured that alternative suppliers of their products existed, spreading technology capabilities within the region. This wave came to an end with cutbacks in defense spending from 1969 to 1971, which stimulated the development of commercial application of defense technology. 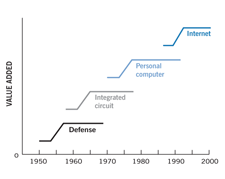 The invention of the integrated circuit in 1959 led to the explosive growth of the semiconductor industry in the 1960s and '70s. Starting with Shockley Semiconductor—which begat Fairchild Semiconductor and its many offspring, including Intel, Advanced Micro Devices and National Semiconductor—more than 30 semiconductor firms developed in the Valley during the 1960s. Only five of the 45 independent semiconductor firms started in the United States between 1959 and 1976 were outside Silicon Valley. Don Hoefler, a reporter from Electronic News, gave Silicon Valley its name during this period. The technology wave had an additional push at Intel in 1971 with the invention of the microprocessor, which established the foundation for the next wave, led by the personal computer. Foreign competition in the commodity chip business challenged this wave and forced the semiconductor industry to shift into specialized chips, including microprocessors. The technology foundation established by the defense and integrated-circuit waves created a rich environment for launching this next wave. Silicon Valley had attracted a critical mass of technology firms, support industries, venture capital and talent that helped ignite the PC revolution. Young talent meeting at the Homebrew Computer Club eventually gave birth to more than 20 computer companies, including Apple. The explosive growth during this technology wave led to an increase in the number of Valley firms, from 830 in 1975 to 3,000 in 1990, with an increase in employment from 100,000 to 267,000. The initial focus on personal computers that became commodities quickly led to the development of more sophisticated workstations, led by firms such as Sun Microsystems. During this wave, the seeds were sown for the next innovation, built around networks. After a period of slow economic growth in the early 1990s, during the defense cutbacks following the end of the Cold War and growing global competition in both the semiconductor and computer hardware industries, the question arose about what Silicon Valley's next act would be. Could the Valley reinvent itself once again? The answer became clear with the commercial development of the Internet in 1993 and the creation of the World Wide Web. Building on its prior technology strengths, the region became a leader in the Internet revolution. The result was the explosive growth of Internet-related firms. At the forefront were Netscape, Cisco and 3Com. Between 1992 and 1998, software jobs grew by more than 150 percent, and jobs in computer networking doubled. Computer firms such as Sun and Hewlett-Packard, and semiconductor firms such as Intel and AMD, grew along with their Internet markets. The overcapacity created during the Internet bubble led to the current slowdown. Silicon Valley again reinvented itself in the 2000s in the aftermath of the dot-com bust. The transition of the Internet from strictly an information and communication tool into a dynamic and interactive means to facilitate information sharing and collaboration provided countless business opportunities and spurred many new firms in Silicon Valley. Continuing the trend of focusing on individual users and personal consumption that began with the personal computer, Web 2.0 companies design their products and services with the understanding that people should not simply be passive consumers of the Internet. Instead, they should actively engage in shaping the information and services that the Internet provides. Over more than 60 years of its recent history, Silicon Valley has demonstrated remarkable resilience. With each wave of innovation and in-migration, the economy and community have adapted. Although the dynamism of high-tech makes it difficult to predict exactly what the next wave of innovation will be, there are several trends that will shape the economy of the future. By understanding these realities and realigning resources accordingly, Silicon Valley can position itself to compete for technology-based companies in the face of growing competition from many other city-regions around the world. Since its establishment in 1939, NASA's Ames Research Center has been at the forefront of innovation in Silicon Valley. In the early 2000s, Ames formed research partnerships with some of the region's largest technology firms, including HP and Google. What factors will be key to Silicon Valley's next wave of innovation? More and more, product value stems not just from a product's creative new technical features, but from the product's design and other immaterial qualities that please consumers. Nontechnical elements—design, ease of use, brand, personalization, quality of service, distribution experience, content—are becoming more important ways of creating and sustaining competitive advantage for technology products. This new-found importance on design and consumer products is somewhat of a departure from Silicon Valley's history as primarily a producer economy. Traditionally, most Silicon Valley companies produced products that were sold to other businesses, and were then used as inputs to final products or for production support (for example, semiconductors, electronic components or semiconductor equipment). Today, more Valley companies focus on consumers. Some of these, such as Yahoo, eBay and Google, emerged during the Internet boom. Others, "old" by Silicon Valley standards, are energized around new consumer products. Even some product companies, such as Intel, are making significant investment in the "soft" technology of consumer branding. In many ways, Silicon Valley has been, for a long time, an "idea economy"—a place where companies and communities have grown through developing and using new ideas. Since the early days of Hewlett-Packard, the Varian Brothers and Fairchild Semiconductor, the value of technology products invented here has come not from the physical inputs themselves, but rather from knowledge and intellectual capital that combine and augment basic physical materials (such as silicon) in powerful ways. drive the creation of new ideas, methods, products, services, and business models will be more important than ever. broad, deep base of creativity and innovation. New types of skills, capacities and community infrastructure are required to successfully implement this new vision and excel in emerging industries and markets that will drive the high-tech economy in the future. One interesting implication of this shift is that people with specific training in art and design are taking their place in the high-tech workforce. More people with training in fields such as product design, interactivity, user experience, web design, animation, graphic design, digital media, game design and brand strategy are working in high-tech as employees, contractors or consultants. and synthesize and form strategies. Competing on creativity requires new attention to the community quality of life and infrastructure, the context in which creativity is nurtured and takes place. The very nature of the community—the kinds of creative outlets and atmosphere it provides—affects the creativity of current employees, and the ability of employers to attract and develop new talent. Creating places and urban spaces—something that is currently lacking in much of Silicon Valley—has been the focus of urban planning and economic development efforts recently, and will continue to be central to the Valley's attempt to remain a desirable destination for talented workers. Although it's impossible to predict the future, Silicon Valley understands the importance of remaining relevant among ever increasing global competition for desirable high-tech industries. To do this, leaders are doing their best to anticipate trends and understand the key elements that will provide the area with both the capabilities and the flexibility to compete when the next wave of innovation emerges. Kim Walesh is Chief Strategist for the City of San Jose.